Holographic embossing machines are designed specifically to individual customer requirements relative to web width, embossing speed and complexity. The following steps explain one method for the commercial production of a holographic image of a three-dimensional object. 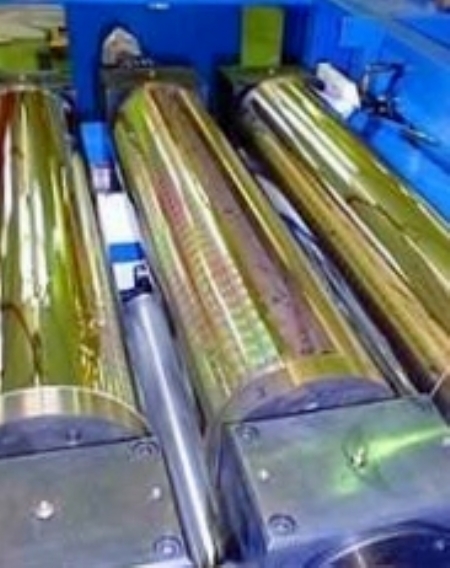 Embossing: Stamper shims are mounted in embossing machines. 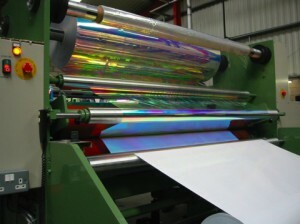 A roll of polyester film, or a similar material which has been covered with an acrylic coating is run through the machine. Under intense heat and pressure, the shim presses the holographic image onto the film transferring the image. The embossed film can then be rewound onto a roll for finish converting. Mastering: A laser is used to illuminate the physical object, with the reflected light falling on the plate. Simultaneously, a reference beam from the laser also falls directly on the plate. The interference patterns of these two light beams react with the photo-sensitive coating to record a holographic image of the object. The plate on which the original hologram is recorded is called the master. Electro forming: The master is mounted into a frame work (JIG) and sprayed with silver paint to achieve good electrical conductivity. The jig is lowered into a tank along with a supply of nickel. An electric current is introduced, and the master is electroplated with nickel. The jig is removed from the tank and washed with de-ionized water. The thin, nickel coating, which is called the metal master shim, is peeled off the master plate. It contains a negative image of the master hologram (the negative is actually a mirror image of the original hologram). 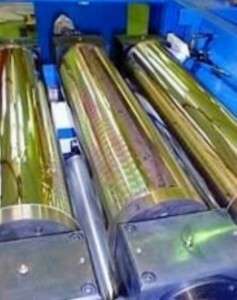 Using similar processes, several generations of shims are created. Those made from the metal master shim are known as “grandmothers,” and they contain positive images of the original hologram. At this stage, numerous copies of the original image are “combined” (duplicated in rows) on one shim that can be used to print multiple copies with a single impression. The stamper shims are negative images that will be used during actual production runs to print the final product holograms.